Amid Crackdown, Egypt Sentences 152 People To Prison For Protesting : The Two-Way It's another sign that President Abdel Fattah al-Sissi will not tolerate dissent. Demonstrating without government permission is illegal in Egypt. The protests last month were small, but significant. Egyptian protesters demonstrate in Cairo on April 25, 2016, against the handing over of two Red Sea islands to Saudi Arabia. The people sentenced are accused of participating in the protest. Egyptian courts have sentenced 152 people to prison time over a peaceful demonstration against Egypt's president last month. It's another sign that President Abdel Fattah al-Sissi will not tolerate dissent, amid a widespread crackdown on opposing voices. The demonstrators were found guilty of protesting. In 2013, Egypt banned all demonstrations that haven't received prior government approval. The protests at the center of these trials focused on Sissi's controversial decision to hand over two Red Sea islands to Saudi Arabia, which he said were actually Saudi territory. Saudi has given Egypt billions of dollars in aid since the coup (which Sissi led) that ousted Islamist President Mohammed Morsi in 2013. As NPR's Leila Fadel explains, the furor that Sissi's announcement unleashed really comes down to nationalism: "people really saw this as an affront to their nationalism and to their territory." "It's a very bizarre twist, whereby the ultra-nationalist pro-Sisi constituency that had been rallying behind him for the past two years, specifically on the grounds that he is protecting national security, these same people are today hoisting Saudi flags and claiming that these islands are actually Saudi islands. And the government is having severe crackdown on anybody who dares to say that these islands are Egyptian." But they were significant in light of the brutal political climate. This is seen by many as the most dictatorial regime in Egypt's recent history. Tens of thousands of government critics sit in prison. As the Associated Press reports, "More than 1,200 arrests were made in the run-up to April 25 and on the day. 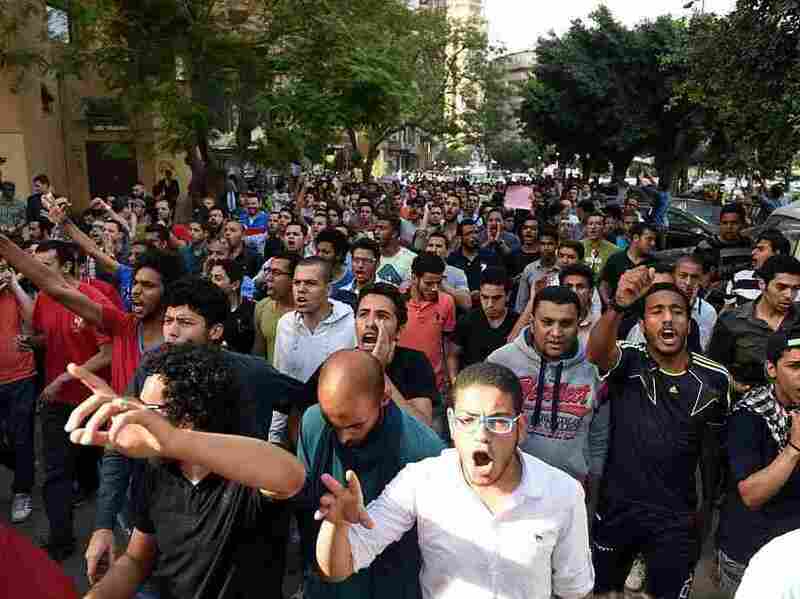 Most of them have been released but nearly 300 faced formal charges and were referred to trial for breaking the protest law." The wire service adds that Sissi has "angrily demanded an end to public criticism of the deal." On Saturday, in a separate case, prominent activist Sanaa Seif was sent back to prison on a six-month sentence for "insulting the judiciary." "I've had the experience of dealing with the system as a plaintiff and as a defendant, and now I'm required to play, again, the role of the accused, and the lawyers are required to use up their energy defending me. "Well, this time, I will not play along. I just don't have the energy. "I am not taking this decision lightly. Being in prison isn't easy and I know that. ...But since they insist on setting me up it's clear there's going to be price to be paid. So at least I'll pay it on my terms."